"The return of a legend." 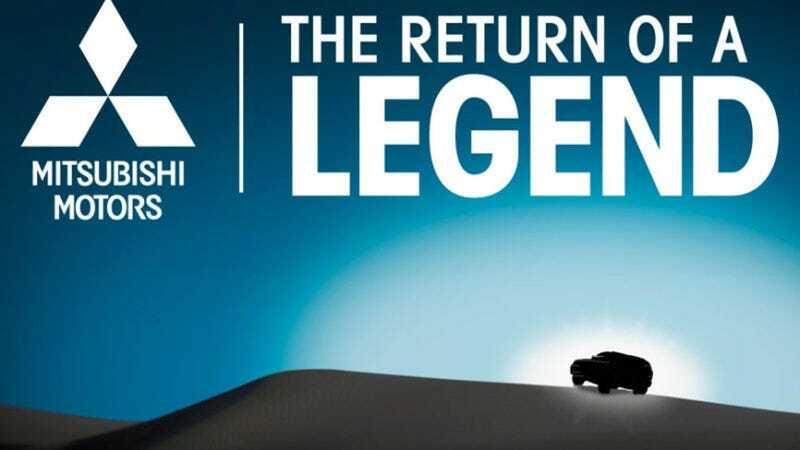 That's what the teaser image says, with the image of a distinctly SUV-like vehicle sitting atop a sand dune. What else could it be besides the Montero, the rugged sport utility vehicle from the days when Mitsubishi's lineup was actually kind of awesome? That's what they're teasing here with some debut at the Chicago Auto Show in February. While the Montero name seems poised to return, the vehicle itself will probably be the Mitsubishi GC-PHEV concept from 2013, or some refined, more production ready version of that. The Montero, or Pajero in most other markets, has been around since the early 1980s. While the name has been out of America since 2006, it remains in production for other places around the globe. However, according to company spokesperson Alex Fedorak this isn't an entirely new vehicle. Mitsubishi is giving the GC-PHEV concept (pictured below) its North American debut, after originally unveiling it at the 2013 Tokyo Motor Show. While it's purely a concept, the vehicle is "a designer's rendering of what a new Montero could look like," said Fedorak to Autoblog. Either way, it's unlikely to be some off-road capable 4x4 like the Monteros of yore, because buyers don't really go in for that kind of thing like they used to. Still, it's a recognizable name, and a good one. I'm glad to see it make a comeback, if that's what happens here.